The former Roman town and Free Imperial City is located on the southern edge of Franconian Jura in Bavaria. In the period around 90 A.D., Roman troops built the fort BIRICIANA in this strategically important location and opened Roman Baths in the settlement a short time later. The first mention of the town of Weissenburg came in deeds dated 867. The town was home to a carolingian royal residence and received the status of a Free Imperial City in the early 14th century, maintaining this status until it became part of Bavaria in 1802. The historical townscape is dominated by the largely intact town walls featuring 38 towers, as well as the “Seeweiher” moat, the gothic town hall, St. Andrew’s Church and the “Ellinger Tor” city gate. 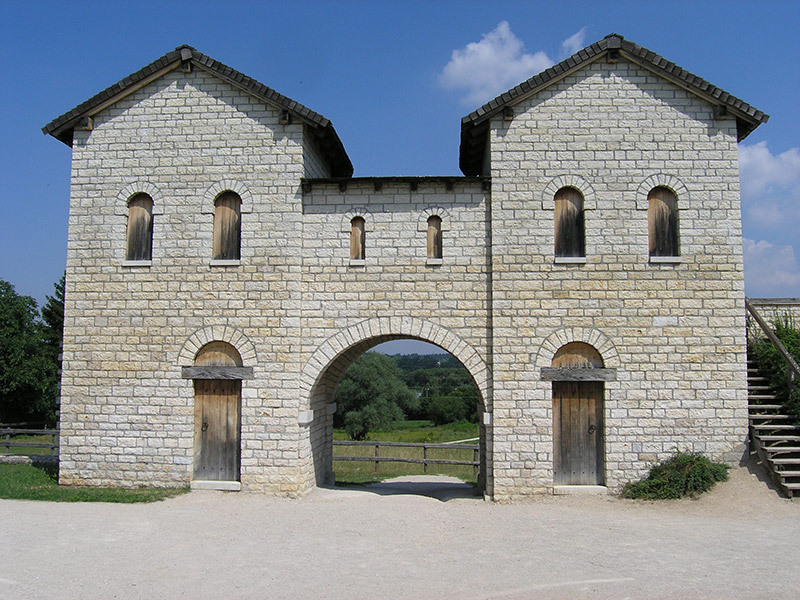 The remains of the cavalry fort built in 90 A.D. include the North Gate (reconstructed in 1989/90), the preserved walls, as well as a visualisation of the fort’s stone buildings with stone panels. The Roman Baths are thought to be one of the best preserved and most important examples remaining in Southern Germany today. They were built by the military as civilian baths in 100 A.D. and their remains are now housed within a shelter. The information Display wall offers an introduction to the topic with larger-than-life graphics, orthophotos and informative descriptions. In addition, the films “Macht, Pracht und Untergang” (“Power, Splendour and Doom”) mand “Paraderüstungen der römischen Reiterei” (“Parade Armour of the Roman Cavalry”) help to bring Roman history vividly to life! The centrepiece of the permanent exhibition in the RömerMuseum is a hoard of 114 objects discovered by an amateur gardener in 1979. These artefacts are presented alongside both military and civilian objects from the frontier region. The Bavarian Limes Information Centre (BLIZ) is dedicated to the history and importance of the almost 550 km border (“Limes”) separating the Roman Empire from Germania. In 1977, during the excavations to the west of the fort of Biriciana, massive Roman stonework was found which turned out to be part of a large Roman spa. Following extensive conservation and reconstruction work, the bathhouse was opened to visitors in 1985. Raised walkways guide the visitor around the covered site. Information panels, a scale model, and a virtual reconstruction of the spa (100-230AD) allow the visitor to comprehend the building’s development. Also worth seeing are the films with 3D sequences about Roman Weißenburg, and the documentation "Rider of Rome", which brings to life Roman Weißenburg and its fort using modern technology. The newly-designed Roman museum and the Bavarian Limes are open again since 15th March 2017. You can see Roman archeological finds from Weißenburg and the surrounding area. Visitors will be familiarised with the Roman history of Weißenburg and the area north of the Danube. The exhibition will also focus on the meaning of the Limes as a frontier of the Roman Empire. Central to that aim is the famous treasure hoard, discovered in 1979, which is one of the largest and most important finds in Germany. The find contains high-quality pieces of Roman art with examples of Roman gods and cultural objects. Unique in quality, composition, and quantity are the 17 statues of Roman gods and goddesses, which were produced in the second century AD by diverse craftsmen across the Roman Empire. All the artefacts were buried by the Romans to save them from falling into enemy hands. The Bavarian Limes information centre (BLIZ) in Weißenburg, in the foyer of the Roman Museum, forms the main knowledge exchange for the UNESCO Limes world heritage site in Bavaria. The freely-accessible rooms give information about the origins of the Limes and the ongoing research, as well as information about Roman life along the former Roman border. Also available is information about other parts of the frontier such as Hadrian’s Wall and the Antonine Wall, as well as the background of the UNESCO World Heritage Convention. The most impressive Limes section in Bavaria is located north of Oberhochstatt (south of WP 14/40). The Limes, the so-called “Teufelsmauer”, runs through the landscape over a distance of several kilometres in the form of a dam and in a perfectly straight line and is clearly marked by a hedge (“Pfahlhecke”).